Architecture at the Edge (AATE), a celebration of exceptional architecture in the West of Ireland commenced last weekend and continues tomorrow Friday. Featuring a series of talks, tours, workshops and exhibitions, the festival invites people of all ages to explore the built environment of their city and county. 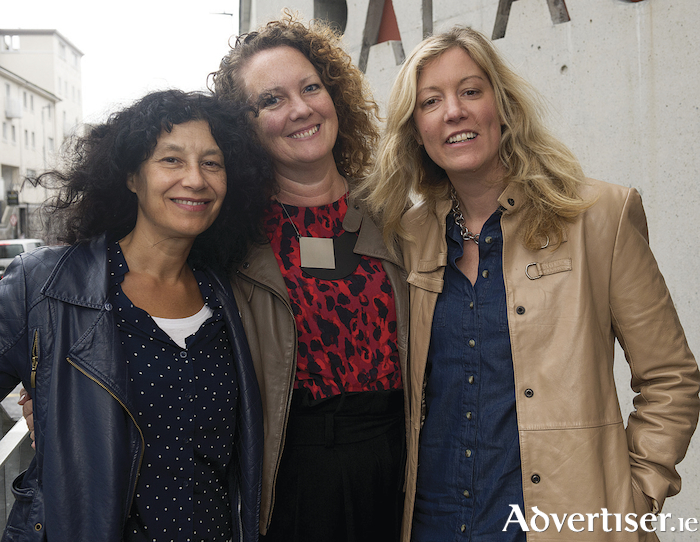 Pictured above are Jill McGregor, Clora O'Neill, and Rachel Stewart at the Architecture at the Edge (AATE) where architect Tom dePaor spoke about the design of the Palás. Photo: Andrew Downes, XPOSURE. While the referendum on blasphemy has been overshadowed by the presidential election, the Galway West Labour Party is calling for a Yes vote, saying it would “remove a problematic anachronism from the Constitution”. The vote to remove the offence of blasphemy will be held on Friday October 26, the same day as the vote to elect the president. According to Labour GW chair, Dr Andrew Ó Baoill, there is “a worry that many voters may be unaware it is taking place, or unfamiliar with the issues involved”. To those concerned that removing blasphemy as an offence could give the green light to hate speech - acting disingenuously under the cover of free speech - against minorities, Dr Ó Baoill points out that if the referendum is passed, “it will still be possible for the Oireachtas to regulate incitement to hatred and other forms of speech that have actual potential to cause harm”.